Back in the 1970s, Bob Guccione, founder of Penthouse Magazine launched a new magazine called Omni. Omni was devoted to science, the paranormal, sci-fi/fantasy stories, and technology in general. My parents would pick up copies regularly and so they became fundamental objects in my childhood. 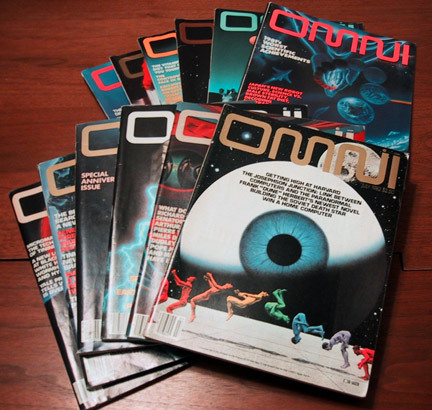 Omni Magazine was the Wired Magazine of the 70s & 80s. Everyone from Nobel Prize winners to UFO crackpots were interviewed. News of new and fascinating inventions and ideas were a regular part of the magazine. Recently I thought about a story I read in Omni at this time and wondered what ever happened to the magazine. I did a quick search on ebay and was happy to find plenty of copies. I bought the 12 issues from 1982, my last year of junior high school, when I was intrigued with computers, BBSs, girls, and the science in general. As I flipped through the pages, the old neurons flickered to life as I recalled many of the images and stories as if it was only yesterday when I last saw them. The fiction is from well known authors such as Connie Willis, Harlan Ellison, Orson Scott Card, Robert Silverberg, Greg Bear, Isaac Asimov, Fredrick Pohl, Dan Simmons, Frank Herbert, and Ben Bova. Hell, the July 1982 issue has Burning Chrome by William Gibson in it. Omni Magazine was THE place for the launch of the internet age. The same people that were cobbling together usenet, the internet and building BBSs were reading Omni Magazine every month. 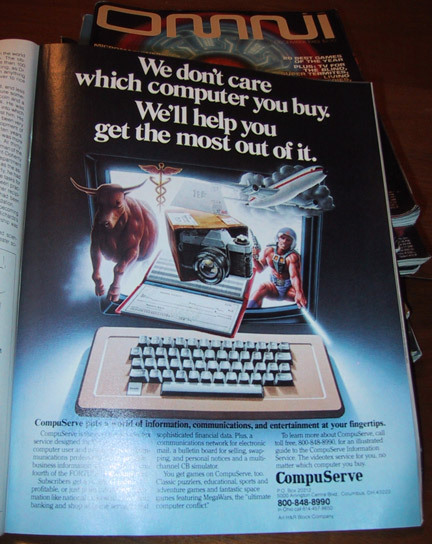 Here's and ad for the revolutionary service, Compuserve. Twenty-three years ago, they were trying to reel in customers with promises of online finance, travel info, games, and images. Not much different from what AOL offers today. In some ways the world hasn't changed much. The funniest part of the magazines is looking at the ads. Ads for booze, cars, and cigarettes are bascially the same as today. But the technology ads are blast. Seeing the IBM ads for their computers starring their the Charlie Chaplin lookalike are incredibly dated. 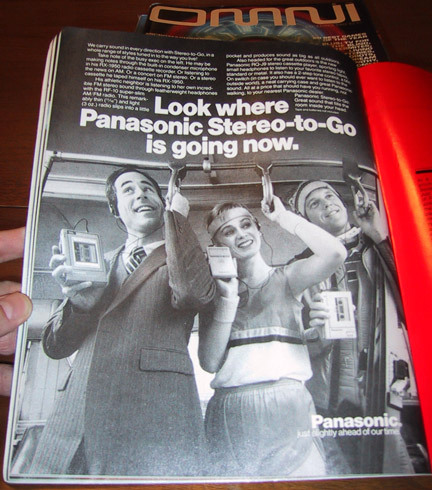 Check out the ad above about the Panasonic knockoff of the Sony Walkman. It should be a reminder to the iPods fantatics as to what lives ahead for Apple's current hit product. Back in the early 80s, the Sony Walkman was the defacto standard for personal audio, bouyed by Sony reputation and great product, but as the market matured, Sony any semblance of an edge and personal audio player were completely commoditized, made by the cheapest vendor. It won't take long for the iPod's currently huge marketshare to drop once the the inevitable market forces (and the Walmart factor) take hold. Seeing the ads for Betamaxes, cassette players, and cordless home phones remind me that whatever today's hot tech items are, they'll be on sale for $20 in a few years at the local discount mart. Back to Omni, I'm glad I took the time to look into the past. Once I've read the fiction, I'll probably put the magazines back up on ebay for someone else to read.